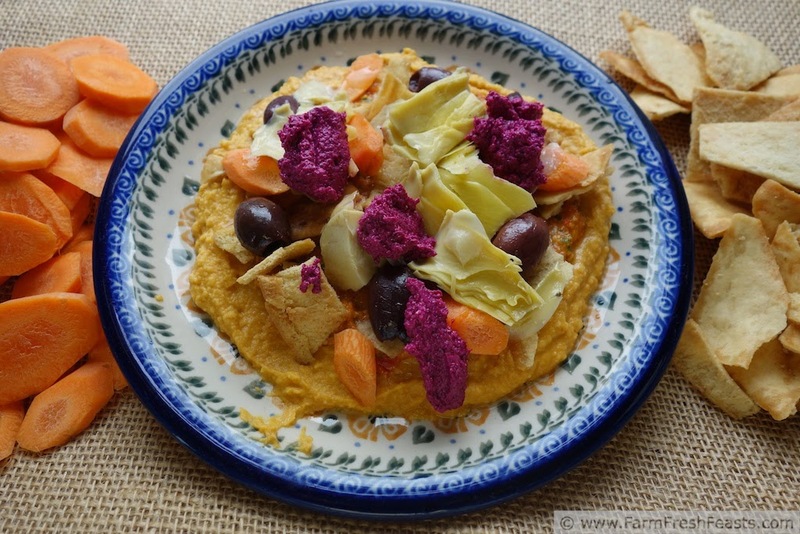 Pumpkin, carrots, beets, tomatoes, tomatoes, olives and artichokes form a fall color palette in this array of appetizers, including Pumpkin Sriracha Hummus. Combine the dips for a layered autumn vegetable appetizer--another Awesome Veggie App and Snack (link to my Pinterest board). If you're rolling your eyes at the thought of a pumpkin recipe already, I'd like to share with you a photo of me that my daughter took on August 6th. 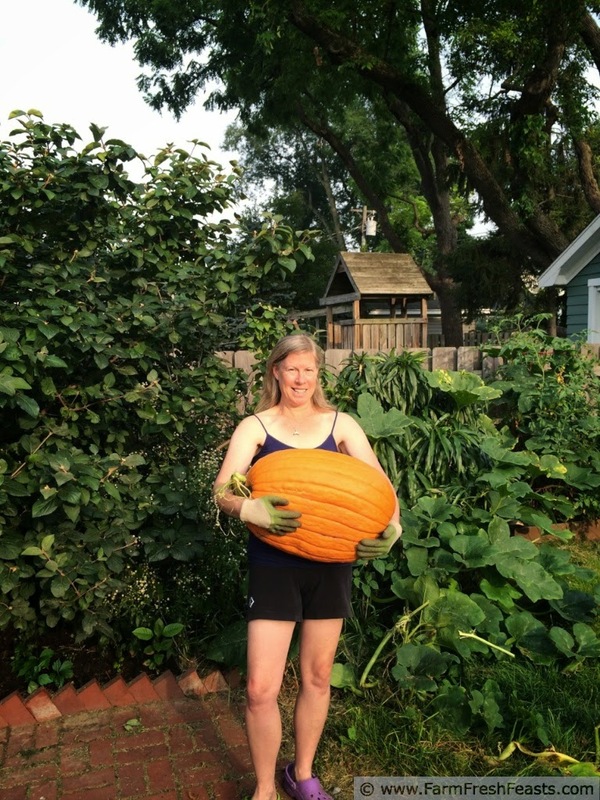 This 42 pound pumpkin was the first volunteer (meaning, I didn't plant it--it came from the compost) I harvested this year. I've since harvested another large one and 5 little ones, including the one shown in the ingredients photo below. I've got 2 more large ones on the vine. So even if you're not ready for pumpkins, the pumpkins are ready for you. Props to me for exhibiting the restraint to wait until after the autumnal equinox before posting. Even though it is easy to whip up and awesome vegetable appetizer in the summertime, such as this fattoush dip with kale hummus or this layered summer vegetable appetizer, the slight extra work involved in the Fall (i.e., turning on the oven to roast autumn vegetables) is not unwelcome. In fact, though I'm happy to warm the kitchen up on a cool fall day, some of these Fall recipes involve nothing more than a food processor or blender. We're now celebrating Fall (and looking forward to more Fall vegetables in the Community Supported Agriculture (CSA) farm share, so here's a suggestion (or 3) of how to enjoy your produce. Since the beets in my farm share are prolific (yet I still cannot get enough beet greens) I wanted to keep rockin' the beets [get it? Rockin' the beets?] but I also wanted some nice fall colors to pair with the beets. I whipped up some Orange-spiked Beet and Walnut spread and thawed a jar of Fresh Tomato Pesto. 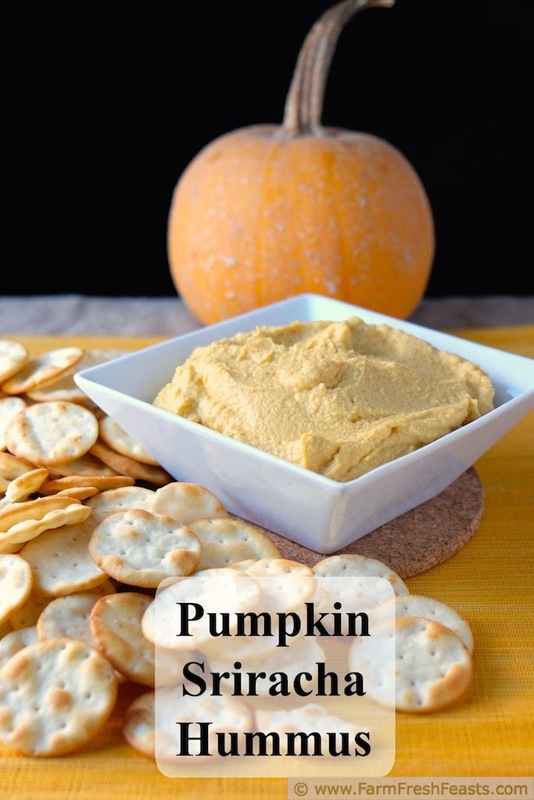 When I saw this incredibly easy pumpkin hummus over at Naptime Chef I decided to whip that up, add a teaspoon (or more) sriracha to half of it for a bit of a kick, and have the assortment of dips shown above. That pumpkin hummus tasted so good that I grabbed one of my pie pumpkins and did it again from scratch (my Sriracha Pumpkin Hummus recipe is below). Layer all of these flavors on a platter, add some preserved and fresh vegetables for different textures and flavors, and you've got yourself a feast for your eyes and your belly--and that of a male as well. Now, this is not a comment on 'girl food' vs 'man food'. Far from it! More like an observation on changing perceptions or stereotypes of gender-related food choices. I participate in a photography group on base, and last week we were hanging our photos for display on the wall of the club. The theme was 'wild color' so I submitted the first photo of this post. An elderly veteran and his wife came in and were commenting about all our photos. They asked what was in that picture, and I told them. Then the gentleman commented "and your husband eats that"? "You bet", I told him. He loves a plate piled high with vegetables--though technically he was deployed when I fixed up the plate for me and snapped the photo. His plate would be more piled and less photogenic since 'it's all going to the same place'. Sriracha Pumpkin Hummus topped with Fresh Tomato Pesto, Orange-spiked Beet and Walnut Spread, olives, and artichoke hearts--a veritable feast. Now matter how your pumpkin arrives--in a can from the store, or rising like a Phoenix out of your compost, you can enjoy this dip--and layer it with other ones to enjoy Fall colors in your meal. Note: If you have pumpkins from your farm share, or the grocery store, here's one of my 2 yr old early posts on How to Process a Pile of Pumpkins for excruciating details on turning the pumpkin into a couple of cups of puree. Cut the pumpkin in half, scoop out the guts [add them to your compost, you never know] place cut side down in a rimmed baking pan, add water, and roast at 400 degrees Fahrenheit for 30 minutes to an hour or until pumpkin is soft. See this post for more details. 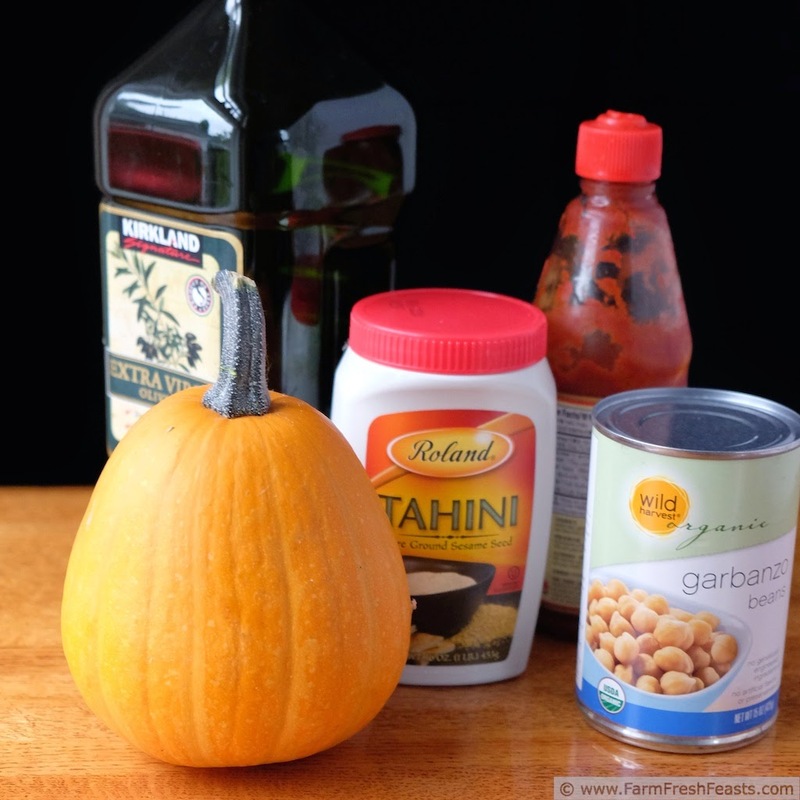 Scoop out roasted pumpkin, or open up a can of pure pumpkin, and dump it into a food processor. Add the beans and pulse a few times to chop. Add the rest of the ingredients and pulse to combine, then scrape down the sides and blend on full power until thoroughly mixed. 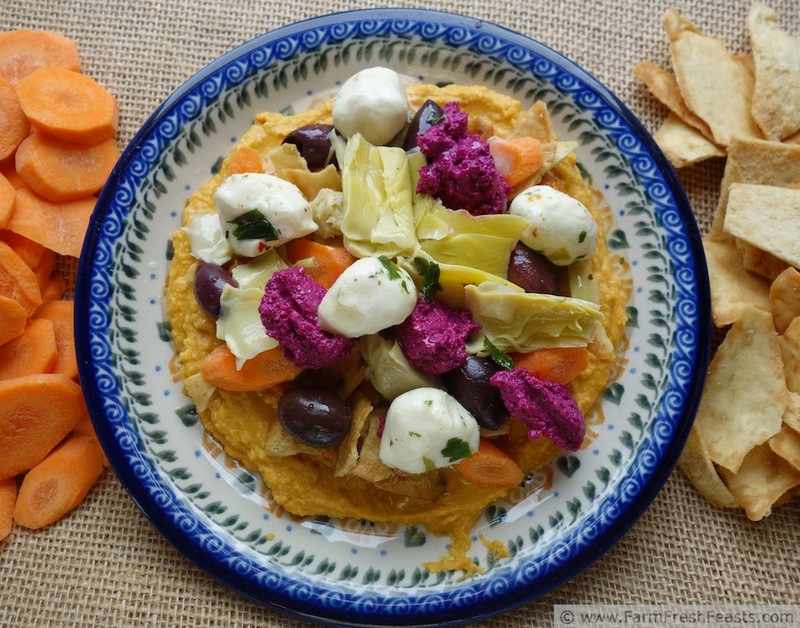 Serve with pepper strips, carrot sticks, pita chips--or whatever floats your fall color palette. I think this photo is absolutely beautiful. I adore the autumn colors and would even eat pumpkin in this form. Besides, it's not so much pumpkin I detest, it's the pumpkin mania which takes over. I like the underdog so I gotta root for the apple. I'd eat this though. In a heartbeat. Thanks! I'm in a photography club on the base, and we put up photos for display on the walls of our activities room. I had a bunch of preprinted photos to pick from, and this one made the cut. The carrot sushi rice one was my other contribution. Very pleased with the composition of them. The rest of the photos rotate in a gallery in my breakfast nook. 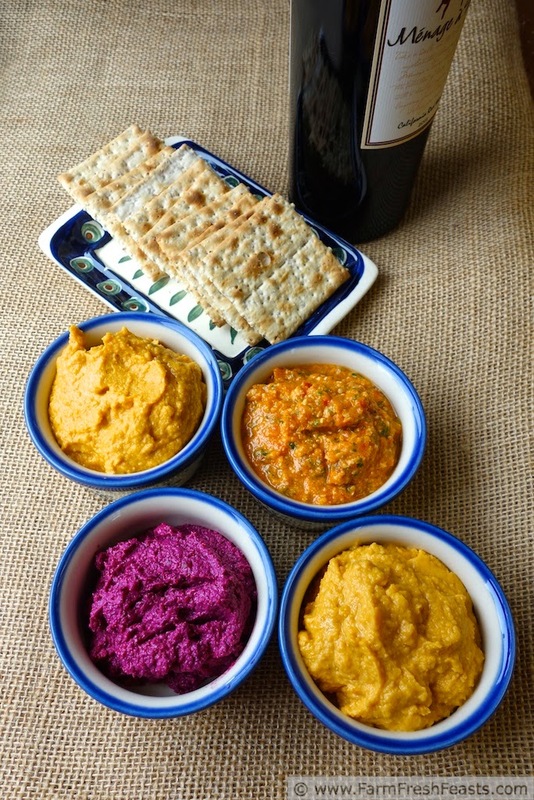 Love the colors in all the dips. Pinned for reference to try some of these! Hi Kirsten! This looks delicious and so pretty for fall! I've featured it in my Thanksgiving: 21 Day Fix Style post this morning. Have a great day!